Here are the next few restaurants that I was able to try in Dayton, Ohio. I like to categorize these as "Places to Pig Out"! To meet the criteria for places to pic out, the restaurants either are serving huge portions, "chipotle-fying" everything, open 24 hours, or all of the above. These are all places that I would come back to in a heart beat and actually wish were open in the Chicagoland area. Check em out! The first place my brother and his wife brought me to was Fusian. This was the first restaurant that I had encountered that adopted the Chipotle-style service. Rather than choosing a pre-made combination of sushi, you get to create your own. First, you get to choose which type of seaweed and rice you want. Next, choose the protein, which includes tuna, shrimp tempura, chicken, steak, and a half dozen or so other types of fish. Now choose the veggies you like, such as cucumber, carrots, jalapeños, and many more. If you thought you were done, you still need to make a decision on which sauce you want... they range from a spicy mayo to a sweet and sour chili to even teriyaki. You are allowed two sauces so take advantage. 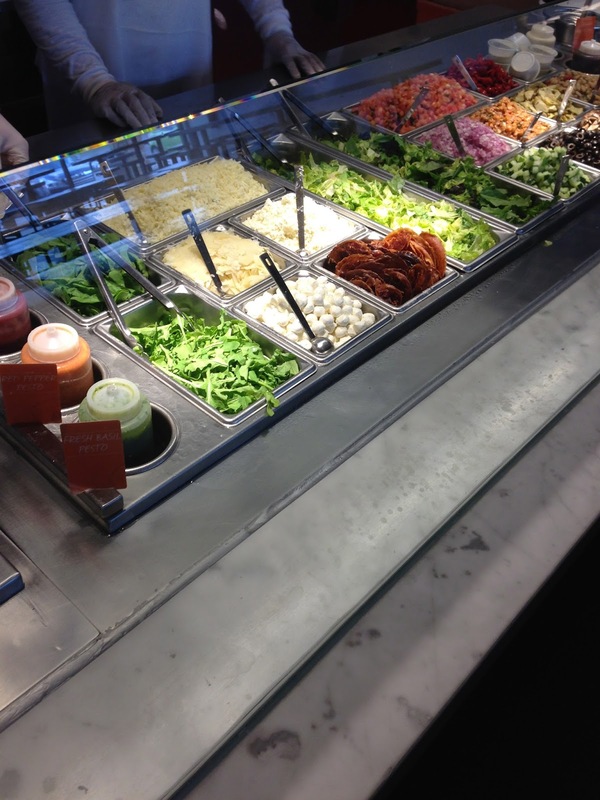 And finally, you can choose toppings. I love the tempura crunch and ginger, but masago (fish roe) is also available for an additional cost. Once everything is chosen, they place the roll into a sushi cutter and there you go... chipotle style sushi at a reasonable cost. Some rolls end up the size of a burrito. Each comes with 10 pieces so don't order too many! After living in Dayton for a week or so, I stumbled across a restaurant that described itself as "Italian Street Food." Having lived in Florence for more than a month, I was excited to see what street food was offered. As I entered, I felt like I walked into a higher class Chipotle. But rather than the typical tortillas and other Mexican ingredients, I saw pasta, rosemary chicken, fried calamari, fresh mozzarella, sun dried tomatoes, and much more. 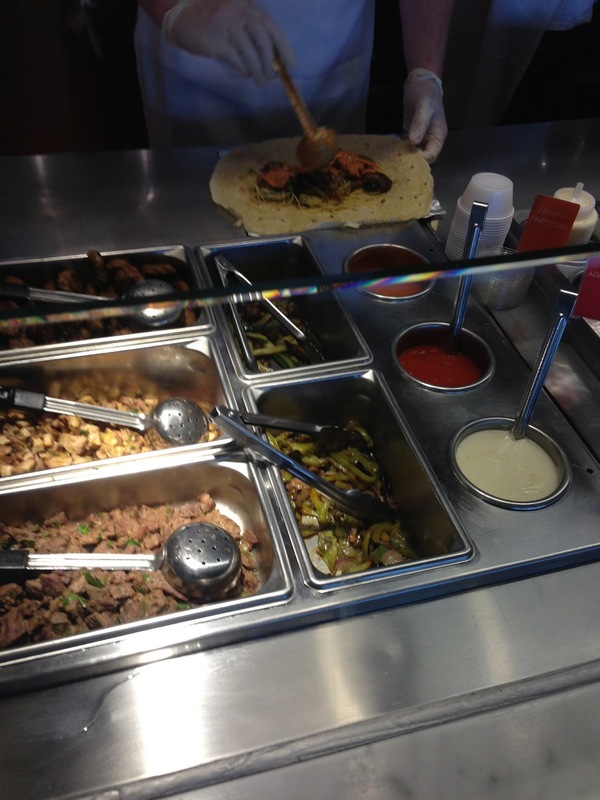 I chose to create a piada, which I like to call an Italian burrito. The thin crust dough was filled with a thin layer of pasta coated in olive oil and parsley. I chose to have italian sausage in my piada along with the following ingredients: artichoke, spinach, arugula, mushrooms, sun dried tomatoes, roasted red peppers, white beans, eggplant caponata, black olives, peppadew peppers, crispy pancetta, fresh mozzarella, parmesan reggiano, a fresh basil pesto, and a spicy tomato diavolo sauce. It sounds like a lot, and it was, but how can you pass up on such fresh ingredients? The piada itself is huge... I finished just half because I splurged and bought an order of calamari and also a pepperoni piada stick. The calamari was fried to order with sliced jalapeños and other hot peppers. 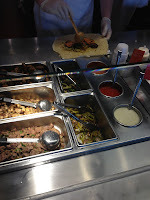 The piada stick was simple... the piada filled with parmesan reggiano cheese and pepperonis. Easily one of the best "fast food-like" restaurants I have tried and one that I continue to crave. When my brother's wife's sister was in town, we went out to eat several times. But somehow, at midnight, she and I were both hungry and craving something sweet. After searching for late night spots, it was revealed that Bill's Donut Shop was a 24-hour hot spot in the Dayton area. We drove towards this long standing establishment and ordered exactly what all the reviews said... the sour cream old fashioned doughnut. This freshly baked doughnut had a cake-like consistency and a sugary icing. We also chose a few random ones, including a peanut butter long john, a traditional glazed, and a banana cream-filled one. All were sweet, rich, and satisfied our craving. I was pleasantly surprised with the restaurant as well. At midnight, all of the booths were filled with the younger crowd. I guess Bill's Donut Shop doubles as a cool hangout. Following my 9-hour marathon exam, I was in the need of a beer and some wings. My older brother and I decided on Rooster's, one of the more popular sports bars in the area. We came during happy hour, meaning my beer was dirt cheap, saving some money for dinner. My bro and I decided to each order 10 wings... I chose the killer sauce (2nd hottest) while my brother chose more of an enjoyable sauce, the mild buffalo. We had previously tried the BBQ and the sweet thai chili, so today we felt like sticking with traditional buffalo flavors. We also stuck with the dumpster fries appetizer: fries covered with melted cheese, bacon bits, scallions, tomatoes, jalapeños, and their dumpster sauce aka ranch. When it comes to the wings, the 10 wing option was plenty. The wings are deep fried and covered in your choice of sauce. Out of all the flavors I tried, the killer was without question the hottest, but still had an enjoyable flavor. The sweet thai chili was the next best, while the mild was just too buttery for my liking. The fries was a great bar food option, especially with a nice domestic beer in hand. Couldn't have asked for a better way to celebrate that exam being over!